Lacrimal caruncle is also known as caruncula lacrimalis. It is the pink small ball shaped (globule shaped) part of eye located in the innermost corner of eye i.e. medial canthus. This is made up of the skin which covers the sweat and sebaceous producing glands. In case of eye allergies, the lacrimal caruncle get inflamed and itchy due to the release of histamine in the tissues of eye. The main function of lacrimal Caruncle is to produce sebum (an oily substance) which holds the tear in the eye and also produce sweat in response to the temperature changes. Lacrimal caruncle get swollen when there is any kind of allergy in the eye. The caruncle also get inflamed when a foreign particle enters to the eye and the eye can’t accept it. So, as a result the lacrimal caruncle start producing sebum and sweat to resist the particle from entering into eye. So in order to treat the inflammation of eye a steroid drops may be used. But if the inflammation is due to the formation of cyst, then a surgical procedure may be used to remove the cyst and ultimately, the inflammation will be cleared. Lacrimal caruncle may get itchy due to many reasons like exposure to the pollen grains, any kind of allergens and dust particles. Also after spending too much time in front of TV and computer makes the eye itchy at the end of the day. Less sebum production from the lacrimal caruncle may cause the tears to evaporate while leaving the eye dry, and this dryness will cause itching in the eye. This itching will not be restricted to a side of eye but it will be in the whole eye. So to avoid itching, the doctor recommend patient to keep the eye wet with drops. 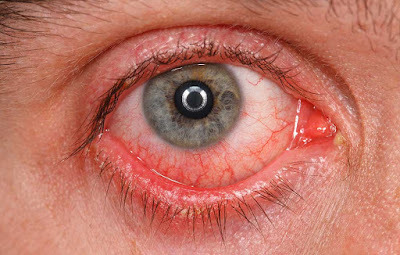 Lacrimal caruncle may show excessive excretion or less excretion of sebum and sweat due to any ocular infection. Infection occurs when any foreign particle enters in the eye. Most common infection reported is the tear duct infection (dacryocystitis). This infection is seen in the tear sac called lacrimal sac due to accumulation of bacteria. The eye may appear red, swollen and painful at the inner corner of the infected eye. Tear production is also enhanced along with puss discharge from the eye. The patient may also feel fever. Lacrimal caruncle may get inflamed, itchy, painful and swollen due to the formation of cyst in the inner corner of eye. The cyst may appear white in color and are closed structures made of tissues. Cyst may contain semi solid liquid which appears white. And the most common cause reported behind cyst is the invasion of bacteria. These cysts block or resist the production and secretion of sebum and sweat from lacrimal caruncle. The cyst formed may be of varying sizes and are painful. But sometimes it appears asymptomatically without any pain and effects on vision.